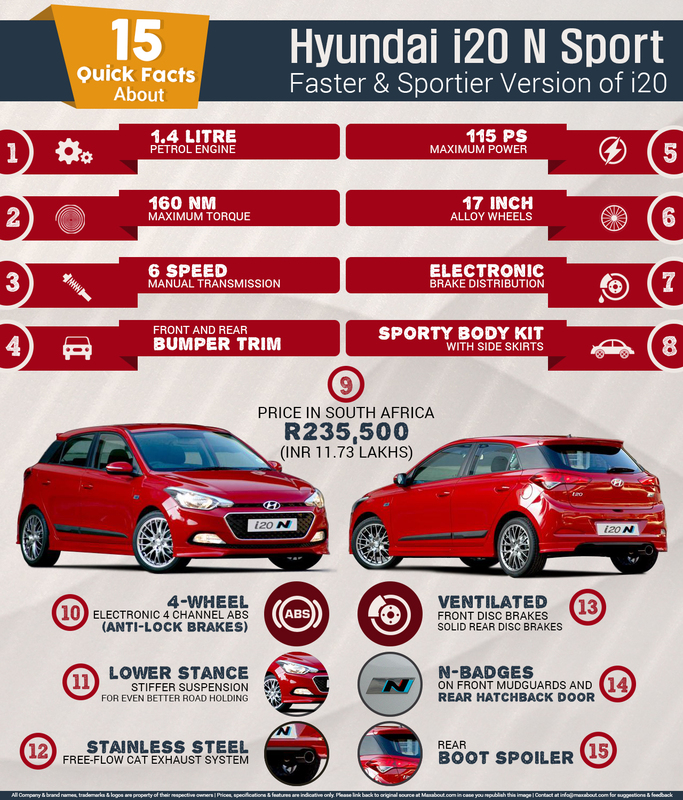 The best looking hatchback gets an all new performance enhanced version, named as the Hyundai i20 N Sport. Launched in South Africa for R 2,35,500 (INR 11.73 lakh), the made in India car gets much more than what is being offered in the country itself. The new N Sport gets a 1.4L petrol motor, producing 115 PS and 160 NM of torque, finely delivered through a 6-speed manual transmission. The power is backed up by better visuals, which include a 17 inch alloy wheels and exciting body additions, which further consist of a sporty body kit with side skirts, front and rear bumper trims and a rear boot spoiler. It gets a stainless steel free-flow CAT exhaust system and N-badges on front mudguards and rear hatchback door. The safety and security of the car is enhanced by a four wheel electronic ABS (anti-lock braking system) with EBD (electronic brake distribution). Ventilated discs are provided for the front wheels whereas the rear gets solid disc brakes. The ride height has been lowered for better on-road control and stability, making it more focused toward precise performance. Hyundai i20 has gained a very good reputation in the hatchback market. Its premium design and refined performance has gained a lot of new customers to the brand, making the car equally popular on both the engine options in India. The further additions for the South African version has made the perfect car a level higher than before, with Indian enthusiast hoping for the same for their nation too.